A Mermaid Washed up on the Beach... The waves were so strong! As a mermaid, I have never swam anywhere besides my typical area near a local marina and once in Lake Leelanau. I can't see very well, so going to new places for a swim is a terrifying thing! However, my dad convinced me to try going somewhere different for a change back in early August. Where did we end up going? Good Harbor Beach, in Leelanau County. Good Harbor is a B-E-A-U-T-I-F-U-L beach that stretches on for what seems like forever. In order to get to the water, you have to take a short, sandy path that is hidden away in a wall of greenery and wild phloxs. It is a sight to behold! But, getting to the lake when you're half-fish can be quite tricky. At first, I thought it would be next to impossible to swim at Good Harbor without having to get into my mermaid tail at the beach, but lucky for me, my dad is a really creative guy, and super smart too! He figured out a rather innovative mer-transportation method that worked like a charm. As it turns out, sleds can be used long past when the snow melts. 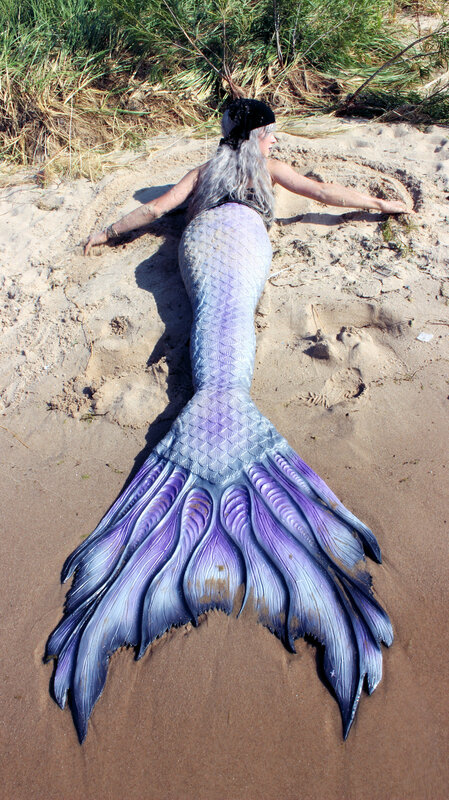 They are great for transporting mermaids across expanses of sand... even clumsy mermaids like me! (Not gonna lie... sand-sledding's a pretty wild adventure as a mer!) I wish I had pictures of the sledding portion of our outing, but sadly the camera-man was too busy dragging me around to take pictures! Hehehe! We did manage to capture some mermaiding footage though. The water was NOT ideal for swimming in, let alone, mermaiding! Honestly, I pretty much told my dad "I can't do this, let's go home" after spending about 2 minutes in the lake. It was murky. It was cold. It was SO WAVY! He helped me plop up on the shore after all of my fussing and we took some of the photos that you see posted here. Then, he went to fetch me some clothing and some towels. While he was walking away, I started thinking about how we had made it all the way to the beach from home. My dad and my little sister waited all of that time for me to do my makeup, put my wig on and put my tail on. They helped move me from the car to the shore, and even took pictures and videos for me. I felt like I wasted everyone's time by being scared off by the less-than-pleasant conditions. So... I asked dad if we could give it another go. Now, please note that I wouldn't have done this if I thought my life, or anyone else's, would be put in danger. I knew I could swim fine in the water, maybe not gracefully, but well enough to not drown or get hurt. It wasn't the fact that the water was choppy that I got out in the first place, it was my fear of the unknown that washed me up on shore. I wasn't prepared for mermaiding in anything that was less than calm. I was used to my comfortable lake back by the marina. I had never been to Good Harbor before. It was uncharted territory. If you watched the video, I'm sure you'll agree with me that the lake was a little rough. Despite that, it was a great day. After I got past my fear, I had a wonderful time and so did dad! While I tried making the video look like I was on some sort of terrible adventure through treacherous waters... what you didn't see (at least not yet ;D) is all of the footage that I cut. All of the smiling, the laughing, the uncontrollable giggles and the fish-flopping-log-rolling that I had to do to splash back into the lake. Had I not "braved the storm" and given it another go, we would have ended the day feeling blue and disappointed. It would have been a long car ride home. Instead, we all went home blabbing on and on about all sorts of silly things... and dead fish. That's a story for another day! Thanks for spending your evening with me! (P.S.) Want to meet a mermaid? Let's talk business! I would love to make an appearance at your festival, party, or other special event! As a professional mermaid, it is my mission to create lasting memories for you and your guests. Click HERE to learn more about how you can hire me for your next private, or professional function. Not in Northern Michigan? I can travel too! In the mood for more? Check out the blog posts below!